Maru is a villager who lives in Pelican Town. She's one of the twelve characters available to marry. She lives north of town with her family in a house attached to Robin's carpenter shop. In the Social Status menu, Maru's outfit will change to a nursing uniform when she is at her job at the clinic. 9:20 AM Working at Harvey's clinic as a nurse. 9:00 AM In her bedroom. 10:20 AM In the laboratory. 1:30 PM Leaving house to go sit on a bench in front of Saloon. 3:20 PM Sitting on a bench in front of Stardrop Saloon. 7:50 AM Leaving home to go to work at the clinic. 9:40 AM Working at Harvey's clinic as a nurse. 6:40 PM At home, in the kitchen. 10:00 PM Goes to her room. 12:00 AM Goes to bed. 2:00 PM Leaving house to go to stand by lake, east of house. 2:40 PM Standing by lake, east of house. 7:30 PM Outside house, looking through telescope. 12:00 AM Heads inside and goes to bed. 7:40 PM Outside house, looking through telescope. 3:20 PM Sitting on a bench in front of the Stardrop Saloon. 8:10 PM Arrives at home. 12:30 PM Leaves her room to stand in the "store" part of the house. 2:30 PM Goes to the laboratory in her house. 4:30 PM Returns to her room. 11:00 PM Goes to bed. 1:30 PM Leaving house to go sit on a bench in front of the Saloon. 2:00 PM Leaving house to go sit on bench, east of Community Center. 3:00 PM Sitting on bench, east of the Community Center. 7:10 PM In her room. 10:20 AM Goes to the lab in her house. 2:40 PM Leaves to sit on the bench by the Community Center. 7:40 AM Leaving home to go to work at the clinic. 2:10 PM Leaves house and heads to the bench to the right of the community center. 6:00 PM Leaves the bench and heads home. 7:10 PM Back in her room. 10:00 PM In bed for the night. 7:00 PM In room, working on her "Device"
8:10 PM Back in her house. Maru lives with her parents Demetrius and Robin, as well as her half-brother Sebastian who is Robin's son. She has a strained relationship with Sebastian and wishes they were closer. Maru works for Harvey at the clinic, and both worry that it doesn't receive enough patients. ※ Note that Dinosaur Eggs are considered Artifacts and not Eggs for gifting purposes. Enter the mountain on a sunny day, between 9pm and 11:40pm. 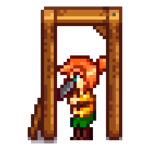 You see Maru looking through her telescope. She's surprised to see you out so late, and says she wants to show you something. You look through her telescope and she asks what you see. "うつくしい惑星。" (友好度+30) Maru responds, "すごいでしょ？"
"ぞっとするようなまっ暗闇。" (友好度-30) Maru responds, "I guess you could see it like that... But it's still grand, isn't it?" Maru says that by the time any of these stars are visited, you'll both be long gone. "I guess that's the trouble with being human, huh?" She begins to tell you something, then changes her mind and shows you a binary star system instead. The cutscene ends as your character thinks, "What a beautiful night! Maru showed me something new..."
Enter the Carpenter's Shop when Maru is there. Maru says she's been working on a new project, something big. She shows you a machine and says it's just one component. She asks you to put your hand on it for a demonstration, flips a switch, and you get electrocuted. Maru is aghast and asks if you're alright. She applies burn cream and apologises. She says that kind of ruined the moment, and sighs. Enter the Carpenter's Shop between 9am and 4pm. Maru says her big project is finally done. She takes you into her private workshop to show you a robot she built to help her parents. She calls it MarILDA, short for Maru's Interactive Laboratory Device Alpha. She tells you she's been working on it for months, and has been waiting for you to come by before activating MarILDA. She activates the robot, who says "ハジメマシテ、まる。答エハイリマセン...言ワナクテモ、マエモッテアナタノ思考ヲ予測シテイマス。"
Demetrius comes in to see what you two are up to. He sees the robot and becomes frightened. Maru tells him not to be scared and that MarILDA is her latest invention. The robot greets him, but Demetrius is upset. "ここ数か月、部屋にカギをかけて閉じこもっていた理由はこれか？ ...ここに（プレイヤー名）も連れこんで、バカげたことでもしていたんだろうと思ってた..." Maru says she's been making this robot to help Demetrius and Robin when she's not living with them anymore. Maru is startled and asks her to wait, but Demetrius says it's OK to let MarILDA go free. "母さんもわたしも、自分の面倒は自分でみられるよ。お前にはもう、自分の道を行けるだけの力がある。わたしの助けも、これからは必要ないだろう。自分がつくったものをごらん...とても高度な領域に達しているようじゃないか。こんなに知的な彼女を召使いにしておくのは、きっと正しいことじゃない。（プレイヤー名）、疑ってすまなかった。きみは<good guyまたはすばらしい女性>だ。Iこんなにいきいきとものづくりをするマルは見たことがない...これ以上ないほど誇らしいよ。これがきみのおかげであるなら、心から感謝したい。" He leaves the room. "きみの発明品って、ほんとにすごいね。" (友好度+50) Maru responds: "ありがとね。本当にうれしいわ、（プレイヤー名）。ガジェットはあなたの得意分野じゃないのは知ってるけど...私の趣味に興味を持ってくれるのはうれしい。何らかの形でお返しをしてあげたいわね。"
"がっかりしたよ…あのロボットをきみのドレイにすればよかったのに。" (友好度-50) Maru responds: "What? After she said point-blank that she doesn't want to be a slave? How cold... You must have a good reason for saying that..."
"MarILDA's just a piece of machinery designed to act human." (友好度+50) Maru responds: "... You have a point, I did program her to act human... but her neural net is so complex, I can't be sure conciousness didn't emerge on its own. Furthermore, isn't it a little arrogant to assume that human-like consciousness is the only worthwhile vessel of existence? Computer brains are different than ours, but that doesn't mean we can disregard them." She thanks you for coming by and leaves. "I was just kidding. MarILDA deserves her freedom." (友好度+50) Maru responds: "I see. Well it wasn't a very funny joke." She thanks you for coming by and leaves. "I would've put her to work on the farm." (友好度-50) Maru responds: "That's horrible! What's gotten into you, <your name>? I'm just going to forget about this conversation... you aren't acting yourself." She thanks you for coming by and leaves. "これできみとの「付きあい」は、お父さん公認になったのかな？" (友好度は変わりません) Maru responds: "Heh... Yeah I guess he did kinda say that, didn't he? ...Um..."
(無言でただマルを見つめる) (友好度は変わりません) Maru responds: "... ..."
You appear back Home after the marriage cutscene with Maru standing on the porch,she says she watered all the crops and put water in your pet's bowl. A smaller and less-interactive version of her old room has been installed in your house attached to your bedroom. She'll also have a small area behind the farmhouse outside where she'll work on small gadgets. Maru will occasionally give you an item at the start of the day, if she begins the day inside the house but not in her annex. She usually describes these items as things she found in her scrap bin, but occasionally she'll refer to having made the item in her workshop. 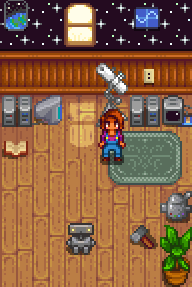 Items Maru gives you appear to most commonly be either a Bomb, Cherry Bomb or Crab Cakes, but she will also more rarely present you with a Warp Totem: Farm. In the evening, she may present you with a Chocolate Cake. マル may randomly request an item at the "Help Wanted" board outside Pierre's General Store. The reward is 3x the item's base value and 150 Friendship points. Maru's look evolved over the years the game was in development. Here's a timeline showing how ConcernedApe's art and Maru's style changed over the years before the game was launched. If you are married to Maru, there is a glitch where she wears her work outfit in bed after any Festival that occurs on Tuesday or Thursday. If you talk to her, she will reply as though she's working (with "I'm at work, honey! Don't let the doctor see").